I went into “Heaven Sent” prepared to love it. I mean, come on. It’s weird, experimental Doctor Who starring Peter Capaldi in what the industry calls a single-hander, a prestige piece by Steven Moffat, and directed by Rachel Talalay. Of course I was going to love it. But the real trick of the episode is in the deferred gratification. From the first minutes when the burned hand of the unseen man painfully pulls the lever, materializing the Doctor in the teleportation chamber and crumbling into dust, I knew it was going to be the Doctor himself, doomed to repeat history ad infinitum. Now, I’m not all that clever. I feel like that was made pretty obvious. The conspicuously unseen predecessor with his elongated skull and thoughtfully folded Doctor-clothes left to dry by the fire. The way everything horrifying (from the shroud-covered manifestation of Death to the sheer boredom, monotony, and claustrophobia of the world) is tailor-made to torture the Doctor. Who else would it be? As he eventually realizes, “How could there be other prisoners in my hell?” So, I didn’t particularly mind seeing that twist coming. The lack of surprise was more than made up by the expertly-deployed “surprisingness” of the way the story unfolded, with the Doctor discovering the rules of the Veil and the castle, exploring its rooms and testing its boundaries. Like the Doctor, we always assume he’s going to win, and so the joy is in watching him figure out how, In his own TARDIS mind palace, no less. Where it started to get dicey was in the second half, when with growing trepidation I started to wonder where this was all going. What it all meant and implied about the world. Like those trapped in the castle of grief and depression, like the Doctor himself, I started to doubt what kind of future there could possibly be from this prison. Not only in the sense of “How will the Doctor get out of this,” but more disturbingly, “Where can the story go from here? How can you tell Doctor Who stories after this?” This is perhaps the most nihilstic vision of Doctor Who I can think of, aside from the terribly bleak three-part finale of series three. On his unparallelled TARDIS Eruditorum blog, Phil Sandifer is fond of examining Doctor Who finales as exercises in what he calls narrative collapse. In a nutshell, season finales are what they are because the threats contained in them dare to threaten the very circumstances under which Doctor Who stories can be told. It’s the logical extension and expansion of the old, well-loved tradition of episodic TV in which Lassie or Flipper or whatever are threatened: The child hides behind the sofa and thinks, “Maybe this really is the last one.” With narrative collapse, even adults and savvy TV-viewers begin to wonder. DOCTOR: It’s funny, the day you lose someone isn’t the worst. At least you’ve got something to do. It’s all the days they stay dead. This is how my world works, Clara. I tick off the seconds as they pass. My life is countdown. […] I think this whole place is inside a closed energy loop, constantly recycling. Or maybe I’m in Hell? That’s okay. I’m not scared of Hell. It’s just Heaven for bad people. But how long will I have to be here. Forever? It’s funny — Chrissie transcribes that last word with a question mark, but I heard it more as a statement. Less a query, and more a revelation. Unnervingly, the fact that by this point I’ve realized something the Doctor hasn’t makes it all the more terrible. He’s tossing skulls into the water, talking about how the stars seem to be seven thousand years too late in time and that’s impossible, and I’m starting to get kind of bummed out. Where be your gibes now? Your gambols? Your songs? Your flashes of merriment that were wont to set the table on a roar? Not one now to mock your own grinning? The joke of Rosencrantz & Guildenstern, of course, is that they are bit players even in their own story, much as the Doctor has been shoved into a confession dial and marginalized by his own people here. The meta-fictional layer of those plots is very Doctor Who, of course, and Moffat gets that. DOCTOR: How long can I keep doing this, Clara? Burning the old me to make a new one? Are we talking about the torture of the castle in “Heaven Sent,” or regeneration in Doctor Who? Or are we even talking about Moffat himself? How many different Doctor Who stories can he write? Even more distressingly, how many times can the show be rebooted? Can the show really, as is so often proclaimed, go on forever? DOCTOR: I’ve just been here a very, very long time. Every room resets. Remember I told you that? Every room reverts to its original condition… All I have to do is find some energy. And all you need for energy is something to burn. Doctor Who burns people out. Doctors. Companions. Actors. Writers. Formats. Clara died because Jenna Coleman wanted to leave and do other things. Moffat has been running the show for around seven years now, and been writing for it for over ten. Are we talking about the existential horror of the showrunner, now? Running on a hamster wheel, constantly trying to find fresh perspectives on old stories. Known for his puzzle-box story structures, Moffat has trapped the Doctor in a literal, inescapable puzzle-box fueled by his own nightmares. But here’s the thing about old, oft retold stories. They’re old for a reason. They’re old because they last. They’re retold because they tell us something we need to know. They don’t have to become worn and stale with repetition, but can gain in strength, power, and meaning. 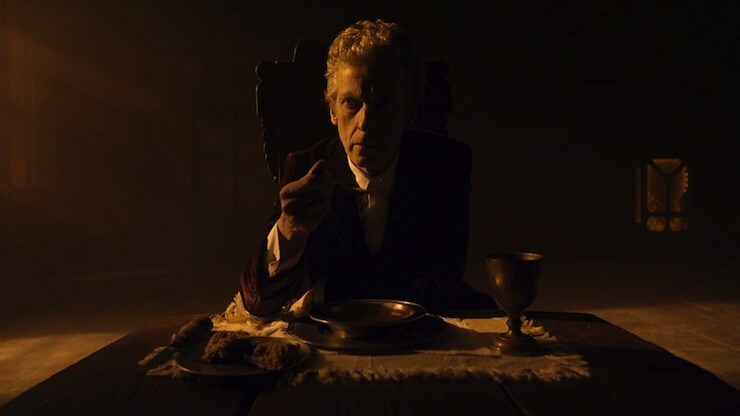 It makes perfect sense that for his salvation, the Doctor invokes the Brothers Grimm and the fairy-tale tradition. They believed a lot of things, not all of them good, but one thing they believed was in the power of old things, and the beauty of things like wonder tales (the German Märchen) and children’s stories. Like the Märchen, “Heaven Sent” is grim, frightening, and violent, but also optimistic. It says that there is light at the end of the tunnel, even if there’s a solid wall of diamond between it and you. Fairy-tales have survived because, like living things, they naturally adapt and change with time. Here’s the full text of the Grimms’ “The Shepherd Boy” in the very comprehensive SurLaLune fairy-tale blog. Interestingly, the narrative itself is pretty sparse. A king asks a shepherd boy renowned for his wisdom three questions (much like Clara keeps asking the Doctor). If his answers prove wise enough, the king will invite him to be his son and heir (spoiler alert: it works out). Probably the most interesting thing is the quality of the child’s wisdom, which is in admitting what he doesn’t know. He frames the answers as a series of impossible tasks: Count the drops of water in the ocean by damming every river on earth; Cover a sheet of paper in black dots to determine the number of stars in the sky. The answers to these questions are so big and unfathomable that they can never be quantified. As Shakespeare’s fool Touchstone quotes, “The fool doth think he is wise, but the wise man knows himself to be a fool.” The Doctor–part wise man and part fool–knows his own strengths and his limitations, and this episode makes him intimately familiar with both. You must think that’s a hell of a long time. Personally, I think that’s a hell of a bird. After the creeping, limping, aching start to this story Talalay’s furious direction as we vault through time is exhilarating: Six hundred thousand years. Two million years. Almost a billion years. Well over a billion years. The editing and music build to a thrilling crescendo that rivals “just this once, everybody lives” and the fusion of the Doctor/Donna as one best examples of joyful eucatastrophe in Doctor Who. That’s a hell of a bird indeed, and the Doctor wasn’t lying when he said he would “never ever stop.” Each time he gets a bit farther, both through the diamond and in his story. There is progress in the repetition, however minuscule. This is the basic alchemical principle of solve et coagula, “dissolve and coagulate,” or to be totally bathetic, lather, rinse and repeat. We get a little further, understand ourselves a little better, with each iteration. The only defeat would be in truly giving up. How beautiful that Moffat uses a fairy-tale to make the point, having the Doctor not only be inspired by its wisdom but moved by its ethics. Indeed, he’s literally moved to action by its aesthetics, as we see in his literal reenactment of it, which is ultimately what allows him to break free. This is one of the single best celebrations of the power of stories in Doctor Who, which is no small compliment. I loved it. CLARA: Get over it. Beat it. Break free. Eliot: For us, there is only the trying. The rest is not our business. This entry was posted in Reviews, TV and tagged Doctor Who, Fairy-tales, Science Fiction, Steven Moffat. Bookmark the permalink. I found your review when I typed in ‘Doctor Who Heaven Sent Rosencrantz’ into the magical Google Machine. I remember the dining hall the doctor eats in as appearing in Rosencrantz & Gildenstern Are Dead. It’s the same set-piece, in more ways than one–reminiscent as you point out. It’s funny how I watch this episode for the first time a year and a half later and stumble here, as if looking across some abyss of time. Beautiful, in-depth & ontological reviews of a beautiful, in-depth & ontological show. Ooh, what a lovely comment! That one’s going on the fridge – thanks very much! 🙂 The internet is a wonderful thing, isn’t it? Wait…are you saying the dining room was used in an actual production of Rosencrantz & Guildenstern? If so that’s fantastic.